Research Verified Joint Relief Review - Is it Effective? Safe? Overall Rating? The purpose of this review of Research Verified Joint Relief is to provide a comprehensive analysis of this supplement and help the customers make an informed decision. We found it was clearly evident that this product is one of the most effective on the market after an extensive research. 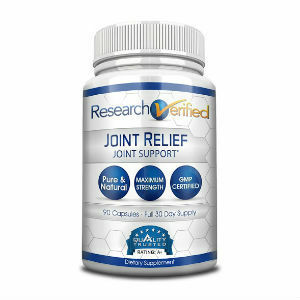 Research Verified Joint Relief is designed not only to relieve sore joints but to also enhance joint movement and relieve discomfort while improving the overall joint health. Keep on reading to find out more about its ingredients and how they can benefit you. The capsules also contain magnesium stearate, gelatin, rice flour and silicon dioxide. The “best results” dosage for this dietary supplement is of three capsules a day. Adults should take the capsules with water one in the morning, one in the afternoon and the last one at night. For optimal results, the label also advises customers to exercise and to keep a moderate diet. Pregnant or breastfeeding women and children under the age of 18 are also recommended to consult a physician before starting this treatment. One container of Joint Relief which contains 90 capsules (enough for one month) costs $49.95. The great news is that the manufacturer also offers various discounts. Therefore, for a mild treatment of two months, the customer only pays full price for one bottle and he can get the second one for only $20. The producer also has some free bottles packages for customers who want an advanced or progressive treatment. For instance, customers can take advantage of the “free bottles” deals: pay two bottles and receive two more free of charge or pay three bottles and get three more free of charge. These are incredible deals especially for people who need to take the supplement on a regular basis. One of the positive aspects of this product is guarantee it comes with. The manufacturer has a 60 day money back guarantee which is pretty uncommon. Unsatisfied customers can return the bottles (regardless if they are still sealed or not) and they can get their money back. The fact that all the details for returning the product are clearly presented on the site is also uncommon. It seems that their customers also think that this transparent return policy and the strong guarantee is amazing, since the official product website only has positive customer reviews. In conclusion, Joint Relief manufactured by Research Verified is clearly a superior product, especially when compared to other similar joint treatments we have reviewed so far. The fact that its ingredients have been thoroughly researched and used in clinical trials is a great advantage. Another positive aspect is the strong guarantee this supplement comes with, not to mention the competitive prices. Last but not least, the positive customer reviews are another reason why we believe that this may actually be the perfect treatment choice. Click here to read more about our Top Joint Treatment Products. Mark Stevens	reviewed Research Verified Joint Relief	on November 23rd	 and gave it a rating of 5.